Sweden star Lindelof endured a tough first 18 months at Old Trafford after his £30million move from Benfica. But the 24-year-old central defender stayed strong and is now a key part of the Manchester United backline. 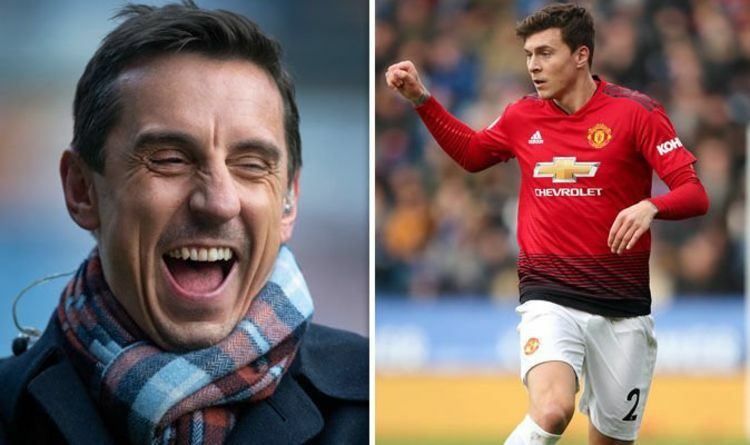 They had to do without him for the Premier League clash with Fulham on Saturday and Neville believes his boots are big ones to fill. “He’s been the best centre-back for Manchester United all season, Victor Lindelof,” Neville told Sky Sports. “It was tough for him last year but he’s improved enormously. Lindelof has attracted plenty of admirers this season and former United star Jonny Evans last week him for not buckling under the brutal pressure of life at the club. Evans, 31, knows it can be cruel if you’re struggling for form and recognition at United. And that’s why the Leicester City defender – who won three League titles under Sir Alex Ferguson in an 11-year spell – praises Lindelof for emerging from the fire at United with a growing reputation. “I haven’t seen all his games this year, but he’s been getting a lot of high praise lately and that’s good to see,” said Evans. “It’s not been easy for him. I’ve experienced that and gone through tough times at United when it’s not gone well. “It’s always good to see players turn it around, resurrect it and show character. That’s what he’s done and I think the fans appreciate that too. “A tough time at United always seems worse than anywhere else. No one would understand that unless they had been there and experienced it. “I can appreciate that, and see that he has kept his cool and shown great spirit and fight to come back and impose himself on the team. “I would imagine he’s one of the first names on the teamsheet now, but people forget that a lot of players take time to settle down.